When many people think of Christianity and Hollywood, they think of protests, pickets, boycotts and “curse-counter” reviews. They think of Hollywood’s longtime reputation of being worldly and scandalous, and the subsequent reluctance for Christians to have much to do with it. But where Hollywood can feel alien and “other” to many Christians around the world, for Biolans, it is much closer to home. Situated just 25 miles from Biola’s La Mirada campus, Hollywood is the defining industry of Los Angeles and the reason why many people flock to the Golden State in the first place. And it’s in Biola’s backyard. Biola’s proximity to the global center of the entertainment industry has not been seen as a liability, but rather an opportunity. 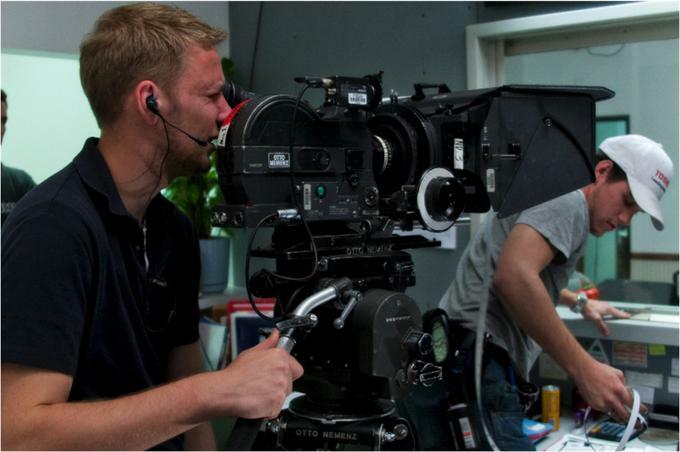 The cinema and media arts (CMA) department at Biola has become home to one of the most sought-after majors at Biola and one of the most prestigious film programs of any Christian university. It’s a program that is committed to working in and with Hollywood, making alliances and establishing a reputation of excellence and partnership rather than mediocrity and protest. Classes in film and television were first offered at Biola in 1971. In the early days, film production classes used the stage in Sutherland Hall as a soundstage, with a makeshift editing room in one of the closet-like rooms off the stage. Everything had to be struck down and cleared away after each class. But in spite of this crude setup, pioneer department chair Tom Nash grew the program and helped solidify crucial relationships with Hollywood industry professionals who would serve as connections, mentors and financial backers for the program over the course of its development. In the early ’90s, Nash developed the Studio Task Force, seeking out Hollywood professionals to invest their time, expertise and resources into students. A coup for the task force came with the involvement of TV producer Michael Warren (Family Matters, Step By Step), who served as the first Studio Task Force chairman and whose personal and financial support was instrumental in the success of the program. With the help of early supporters like Warren, Biola was able to build its first real production center. Today, the facility has been newly renovated into a state-of-the-art, 10,256-square-foot complex complete with two sound stages, a control room, 11 editing bays, an equipment room and a convergent journalism newsroom. In 2003, upon Nash’s retirement, Craig Detweiler became chair of the new mass communication department and expanded the program by doubling the existing faculty and revamping the curriculum. Under his tenure, enrollment surged and Biola gained a reputation as a premier film school among Christian universities. Meanwhile, the department’s “Biola Media Conference,” which had brought Studio Task Force members to speak on campus since the mid-’90s, grew in scope and influence. In 2008, under the guidance of co-directors Peggy Rupple and Kathleen Cooke, the conference moved to the CBS Studio Center in the heart of Hollywood. That same year, with the new name of “Cinema & Media Arts” the department hired its current chair, Jack Hafer, whose vision is to make the department even more industry focused, potentially with a facility in the heart of Hollywood or downtown L.A. In addition to its growing popularity as a major at Biola, CMA is increasingly making a name for itself nationally and internationally through its innovative programs and industry connections. On top of the Biola Media Conference, a thriving internship program and a program at the Sundance Film Festival, Biola film students have the unique opportunity to travel overseas to create short films. Over the last several years, professor Dean Yamada has led interterm groups of students to Tokyo and Berlin to make short films. One of them, 2009’s Jitensha, was screened at more than a dozen film festivals around the world and picked up several awards. Part of the posture of Biola’s CMA department toward Hollywood has included an insistence on humility, service and representing Christ, which has helped Biola gain a great reputation in the industry, adds Cooke. In existence for more than 20 years, the Studio Task Force is a group of over 250 Christian professionals working in the entertainment industry who meet quarterly at CBS Studio Center in support of Biola’s cinema and media arts department. The task force has become a bridge to the industry for CMA students, with each member providing instruction, inspiration or internships to prepare students to pursue their ambitions. Prominent members include Mark Zoradi (former president of Walt Disney Studios Motion Pictures Group), Ralph Winter (producer, X-Men, Fantastic Four), Ken Wales (producer, Amazing Grace) and Scott Derrickson (writer/director of The Day the Earth Stood Still). Since its inception 16 years ago as the “Christian & Media Conference,” the Biola Media Conference has been the marquee event for the CMA program. With the desire to gather the collective wisdom of people of faith successfully working in Hollywood and impart that wisdom to the next generation, the conference has annually connected students, faculty members, churches and aspiring filmmakers with a who’s-who roster of notable Christians in the entertainment industry. 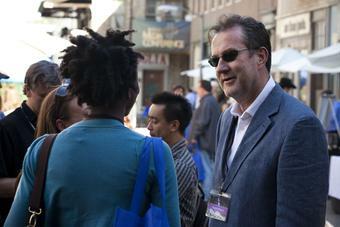 For the past three years, the conference has been held in the heart of Hollywood, “on the lot” at CBS Studios. Attendance has grown to more than 750 attendees, representing 19 states and four countries. The 2011 conference will take place on April 30 at CBS Studios, with keynote speaker Kevin Kelly, co-founder of Wired magazine, headlining the speaker roster. For more information or to register, visit www.biolamedia.com. During the January interterm each year, more than 20 Biolans make the trek to Park City, Utah, for the annual Sundance Film Festival, one of the most important independent film festivals in the world. During the festival, Biola students and faculty watch films and dialogue with filmmakers as part of the Windrider Forum, a faith-based organization seeking to spark meaningful engagement with films and filmmakers. Biola Sundance provides an immersive plunge into the art and commerce of the entertainment industry, giving students a taste of the independent film market and the realities of the distribution process. But it also inspires students to more thoughtfully process the themes of film through the lens of their faith, said Rupple, which in turn benefits the filmmakers, who may not have encountered this perspective on their film before. One of the most valuable assets of Biola’s proximity to Los Angeles is also the CMA department’s most important academic asset: internships. Many CMA students have gained real-world practical experience by landing internships at places like Fox, Warner Brothers, New Line Cinema, Disney Studios and National Geographic Channel. Internship program coordinator Kathleen Cooke notes that these experiences provide invaluable practical experience for students, but also help get Biola’s name out there in the industry in a way that is associated with quality. Henry Riady (’10) co-wrote, directed and produced Sepuluh, which received a nationwide release in Indonesia in 2009. Daniel Parris (’09) led a national campaign to raise funds to film a documentary called Give A Damn? to showcase what extreme poverty is really like as they experienced it on $1.25-a-day. Their work received national coverage when the plane they used to capture aerial footage of the slums of Nairobi crashed, killing the pilot. Taylor Rae (’11) won second place at the 2009 Damah Film Festival in Seattle, Wash., for his film The Old Man and the Ceiling. The 2009 Biola student film, The Dropout, tied for Best Short Film and earned a $1,500 cash prize from the Icicle Fund. The Dropout was also chosen as a semi finalist at the renowned Angelus Student Film Festival, an international competition that boasted 556 entries from 28 countries this year. Jed Saba and Zach King won first place as the Hewlett-Packard brand winners in a contest by Mofilm earning them a trip for two to the Times British Film Institute 53rd London Film Festival, $3,000 in spending money and $5,000 in HP products. Kevin Ulrich’s Chaisson: Rise of the Zerad won best animated short at the Orlando Film Festival. 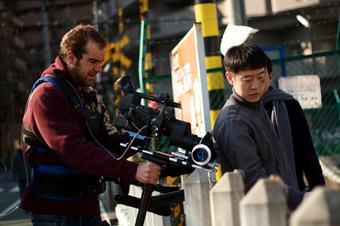 Professor Dean Yamada led the 2009 Japan Interterm film class to Tokyo to shoot a short narrative film called Jitensha. This film has been chosen as an “official selection” at over 20 of the most prestigious film festivals in the world. Jitensha continues to garner top film festival awards and pave the way for future filmmakers at Biola. Written by Josh Prichard and produced by Matthew Jones and Christa Lenk, the 2009 short “A Quiet Fire” won the Sirocco Award at the Action On Film International Film Festival. Matthew Jones won Best African-American Filmmaker in 2006 at the Directors Guild of America Student Film Awards for Be the Man. Part of the award was a prize of $2,500. Written and directed by Dean Yamada, Mujo No Kaze was filmed in Japan as part of an Interterm Biola film class. In 2008, the short won a first place award at The Inigo Film Festival in Australia. Way to highlight the achievements of women in film at Biola. Not one of the notable student films made mention of the involvement of women other than Ms. Lenk. Not one mention was made of the growing gender balance for women in film at Biola, even though Hollywood is notorious for downplaying the role of women and women are still underpaid compared to their male counterparts. None of your pictures highlight any of the many Biola females working in the industry today. Not one mention was made of Lisa Swain's addition to the department or the fact she headed it up for several years after Detweiler's department, until the arrival of Hafer.